The Galway Christmas Market will run this year from Friday November 16th to Thursday December 22nd 2018. The Market opening hours are: Mon to Wed 12 noon to 8pm (bars to 10pm) and Thursday to Sunday 10am to 10pm. The set-up of the market will begin on Friday November 9th , the market will close on Saturday December 22nd and will be fully decommissioned by Monday December 24th. Please note that, as part of the Christmas Market Galway licence application this year, Galway City Council made an order to temporarily close the following road in order to facilitate the event. Period of closure: Sunday 11th November 2018 to Saturday 24th December 2018 inclusive. 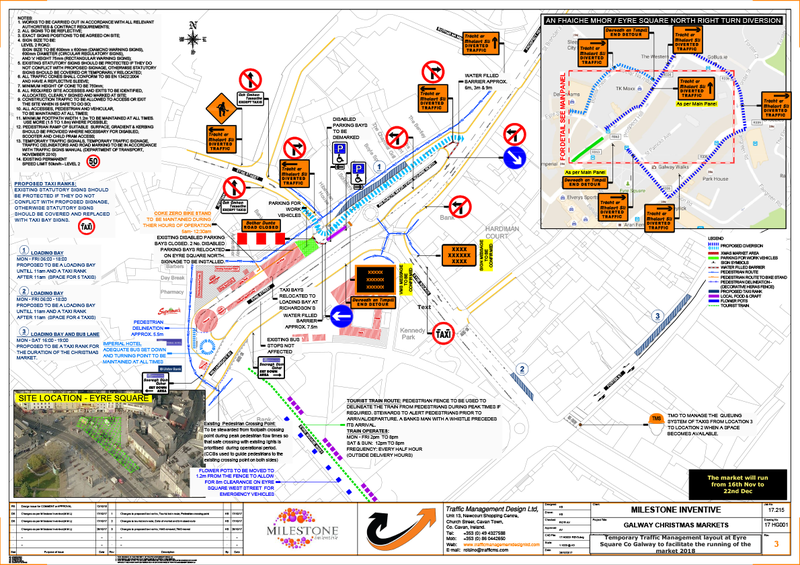 All non-taxi traffic excluded from Eyre Square North to be diverted at the junction of Eyre Street and Bothar Irwin via Bothar Irwin, Bothar na mBan and Prospect Hill. 2. All taxis excluded from the closure to be diverted via Eyre Square North east and Prospect Hill. Pedestrian access will be maintained through signposted routes at all times. Re-location of disabled parking bays: The disabled parking bays which are currently located on Eyre Square North, (outside the Bank of Ireland) shall be relocated Opposite Hibernia House and will be clearly sign posted. Re-location of the Taxi Rank: The Taxi rank which is currently located on Eyre Square North will be re-located to 3 locations: The loading bay and bus lane on Forster Street, the loading bays on Eyre Square North (a) running north between Hibernian Hse and The Charcoal Grill from 11am daily and (b) on the opposite of the road behind the Liam Mellows statue running north, and to Eyre Square East after 11am.